2011-MAY-21 & world end on 2011-OCT-21. He apologized on 2012-MAR & died in 2013. Jesus will come towards Earth. Saved individuals living on Earth will then be similarly changed and rise in the air. This is a relatively new belief in the history of Christianity, but one that is widely accepted by many fundamentalist and other evangelical Christians. The tribulation will occurr. During that time, Jesus will lead a very large army who will exterminate many of those left behind. This will be the greatest genocide in the history of the human race -- over two billion people will be murdered because of their religious beliefs -- a loss of life more than 300 times greater than the Nazi Holocaust of Jews during the 1930's and 1940's. Judgment Day comes, when Jesus would judge individuals and decide whether their final destination will be Heaven or Hell. The end of the world, when the world and perhaps the universe will be destroyed. This is a less common belief among conservative Christians. But he was wrong. It didn't come. Webmaster's comment: The world would be a much happier place if every time the phrase "The Bible says that..." was used, it was replaced with "My interpretation of the Bible is that..."
Harold Camping had previously predicted the rapture for 1994, and lost considerable credibility when it did not happen. However, he rebounded and made a new prediction for 2011-MAY-21 at 6 PM local time in each time zone around the world. He also predicted that the end of the world would occur five months later on 2011-OCT-21. As the vast majority of commentators predicted, the rapture did not happen on that day either. In fact, the Bible did not guarantee it. That failure weakened his credibility as a student of the Bible. He left behind many disillusioned followers some of whom had cashed in all their life savings and assets to promote his ideas. They anticipated being part of the rapture. Some had euthanized their pets to prevent them from starving to death. At least two believers committed suicide to avoid the tribulation. In addition, a woman tried to kill herself and her children, but was unsuccessful. He appears to have had a lot of blood on his hands. Although his prediction of the rapture and start of the tribulation did not materialize, one personal disaster did happen. He suffered a mild stroke on 2011-JUN-14. He died two and a half years later, on 2013-DEC-15. "We would have not been able to be used [by God] to bring about the tremendous event that occurred on May 21 of this year, which probably [will] be finished out on OCT-21 that's coming very shortly. That looks like it will be ... the final end of everything." The end of the world did not happen on that date either. Camping did not make any more predictions after that one. He died during 2013-DEC.
As Harold Camping's prediction of the end of the world for Saturday 2011-MAY-21 approached, some believers anticipated the rapture and a rolling apocalypse taking 24 hours to slip through each time zone until all the world was horrendously affected. But some folks, expecting that Camping's prediction would fail, planned a group of "good-riddance rapture parties" on that day. No matter what happened on MAY-21, they felt that it would personally be a win-win situation. Most were irritated at the intolerance exhibited by some conservative Christians and hoped that the world would be a better place if saved Christians left the Earth and rose into the sky. Also their departure could allow the unbelievers left behind to raid the possessions of the raptured and pick up some free stereos, cell phones, etc. On the other hand, if the rapture was a "no show" then they could make fun of the prediction which, like thousands of predictions before it, never materialized. Five years later, Judgment Day Party lives on. But Harold Camping died in late 2013. 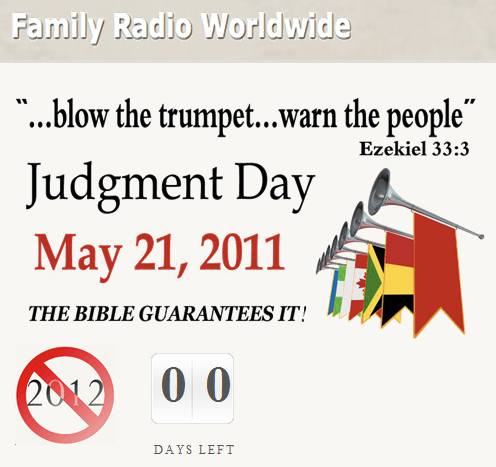 Part 7: Harold Camping's predictions failed again. Media reaction. Note: Actually 2011-MAY-21 was to be the day of the Rapture, when saved Christians were to rise and meet Jesus in the sky. 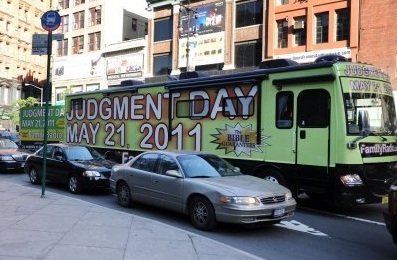 Camping predicted that Judgment Day would be later than year, on OCT-11.